South Korea said Friday that it had turned down a North Korean proposal to hold military talks this week, citing tension over the North's test-firing of seven missiles. 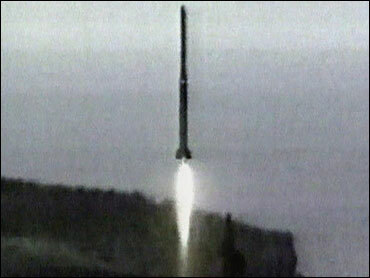 North Korea said its missile barrage was not an attack on anyone. Uncertainty surrounded North Korea's next step. South Korea's defense agency was quoted by a news report as saying that an additional long-range Taepodong-2 missile could be at the North's launch site, but that there were signs that a test would not come anytime soon. Japan, meanwhile, turned up the pressure on the impoverished communist state, announcing that it would not provide food aid to the North and that it was considering restricting agricultural and fisheries trade between the two sides. North Korea is dependent on international food shipments. CBS News correspondent Barry Petersen reports that a North Korean official said a "state of conflict" now exists between the two countries, and warned that Japan could face a "stronger and physical response." Japan's military remains on a high state of alert… especially its sophisticated Aegis destroyers. Petersen says tensions between the two countries are higher than they've been in years. Amid these tensions, he adds, U.S. envoy Christopher Hill met with Chinese officials hoping they can pressure North Korea into returning to talks about the north's nuclear weapons. South Korea's rejection of the North Korean offer of military talks came despite South Korea's vow to press ahead with political and economic engagement with its neighbor as a way to solve the long-running conflict on the divided Korean Peninsula. North Korea made the proposal on Monday, two days before its military fired a salvo of missiles into the sea in a maneuver that caused global alarm. The North suggested that the meeting be held Friday at the inter-Korean border village of Panmunjom, but the South turned down the proposal on Thursday because of tension over the missile tests. "Our side judged that it is not an appropriate time," the South Korean Defense Ministry said in a statement. "We notified the North that we would propose a date at an appropriate time later." The working-level meeting would be aimed at setting up talks between generals of the two militaries aimed at reducing tension along the world's most heavily fortified border. The two sides held the last high-level military talks in May, but failed to produce any agreement because of a dispute over the North's demand that the western sea border be redrawn. South Korea's Yonhap news agency on Friday quoted Choe Myong Nam, councilor at the North's mission to the U.N. in Geneva, as saying that the launches were successful and could be continued, echoing an earlier statement by North Korea's Foreign Ministry. "It's an unfair logic to say that somebody can do something and others cannot. The same logic applies to nuclear possession," Choe said. The missile launches are "not intended to strike anyone and it's the North position that missile launches could be continued," he said. South Korea ordered two South Korean airlines to avoid a flight route near the path of the North Korean missiles fired earlier this week. The Civil Aviation Safety Authority told the two airlines, Asiana Airlines and Korean Air, not to use a flight route over the sea between the Korean peninsula and Japan starting Friday until July 11. It was unclear what the North would do next. Northern officials have threatened to continue the tests, but the evidence from intelligence is not conclusive, suggested Defense Minister Yoon Kwang-ung. Yoon was quoted by Yonhap news agency as saying there was apparently a technical problem with the North's Taepodong-2 missiles and that another launch would have to wait while the glitch is resolved. He added that further tests were also unlikely to be imminent. "Therefore, it doesn't appear imminent for North Korea to fire Rodong or Scud missiles," he was quoted as saying by Yonhap. In addition, Yoon said that North Korea had one boat off its coast observing the missile launches when it fired the seven missiles on Wednesday, but "the boat is now believed to have withdrawn from the area" — further suggestion that more launches might be unlikely. The United States kept up its diplomatic drive to forge a common strategy among the main players in the region. On Thursday, the United States said the world must speak with one voice in pressing North Korea to abandon its nuclear weapons and return to multinational talks. The U.S. and China's senior negotiators on North Korea conferred Friday on Pyongyang's missile tests. U.S. Assistant Secretary of State Christopher Hill and Chinese Vice Foreign Minister Wu Dawei met in Beijing only hours after their presidents spoke by phone. China, which provides oil and other economic assistance to North Korea, is seen as a critical player in diplomacy with Pyongyang. The U.S. has urged Beijing to exert leverage on North Korea, though so far Chinese efforts have been largely limited to diplomatic appeals. In Washington, President Bush expressed support for a draft U.N. Security Council resolution, offered by Japan, to sanction North Korea for its seven missile tests. The launches included a failed test of a long-range Taepodong-2 allegedly designed to reach U.S. soil, according to U.S. officials. "I think we've got to plan for the worst and hope for the best," Mr. Bush said. "And planning for the worst means to make sure that we continue to work with friends and allies, as well as those who've agreed to be a part of the six-party talks, to continue to send a unified message." China, North Korea's closest ally, and Russia, which has been trying to re-establish Soviet-era ties with the Stalinist state, showed little interest in sanctions, saying diplomacy remains the only way to resolve the dispute. "North Korea's defiance puts more pressure on China and Russia," said CBS News foreign affairs analyst Pamela Falk, "and the negotiations are intense at the United Nations to come up with a statement, even if watered down, to censure North Korea. "There are several options being negotiated: Russia and China prefer a non-binding Presidential Statement, which requires unanimity but no formal vote, and the other members of the Security Council are backing a tougher Japanese draft resolution," added Falk, "but the clock is ticking and the pressure is on to pass some form of a compromise statement that reprimands North Korea before the upcoming G-8 summit in St. Petersburg, Russia, and before North Korea launches any additional missiles." North Korea said it had the right to develop and test its weapons and vowing unspecified retaliation against anyone who tries to stop it. South Korea has taken a markedly softer approach with Pyongyang, shelving earlier criticism of the missiles and insisting on maintaining the ties with the North developed in recent years. Unification Minister Lee Jong-seok told the National Assembly in a hearing that Cabinet-level meetings between the two Koreas scheduled for next week should go ahead, and that Seoul would not scuttle cross-border projects with North Korea because of the missile tests.